↑ Ehrlich, Paul R. Ehrlich & Anne H. (1990). 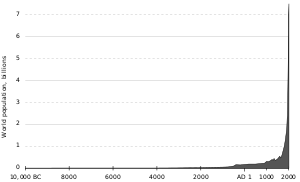 The population explosion. London: Hutchinson. pp. 39–40. ISBN 0091745519. Retrieved 27 जुलाई 2014. "When is an area overpopulated? When its population can't be maintained without rapidly depleting nonrenewable resources  (or converting renewable resources into nonrenewable ones) and without degrading the capacity of the environment to support the population. In short, if the long-term carrying capacity of an area is clearly being degraded by its current human occupants, that area is overpopulated." ↑ "Global food crisis looms as climate change and population growth strip fertile land". Guardian.co.uk (2007-08-31).